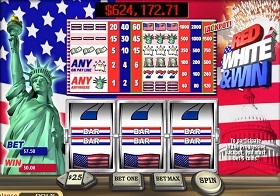 Playing slots in the USA online | Play slot machines at a US online casino. It is not surprising to find out that online slots are one of the hardest games to find a place to play. Don't get me wrong there is no shortage of suppliers, it is the ability to make a deposit that is the problem. No U.S. facing poker rooms have this popular game in their poker client. The Bovada Casino would be your best bet in having a credit card purchase go through. This casino is the best casino for USA online slot players because of their ability to accept a deposit, ease of making withdrawals, their deposit bonuses and wagering limits for slots. Top ranked USA friendly online casino for Slot Machines! Top deposit options available for U.S. slot machine players! People that play slots regularly are a different breed from the rest of us. Slot players tend to love their favorite slot machines. They tend to play at the same game repeatedly until they think they have mastered it. There are many different types of slot games, but they generally fall into these three categories; reel slots, multi-line slots and progressive slots. Reel slots and multi-line slots can be played for free at any legal US online casino. Three-reel slots or traditional slots have three reels that rotate after placing a bet. If the reels line up in a certain way, you will get paid according to the pay table. 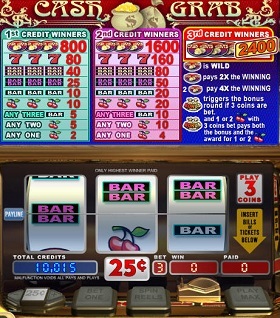 These type of slots are the simplest to play of all the different types of slots. 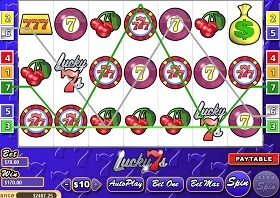 Multi-line slots typically have either five or seven reels. For Lucky 7's you can bet on one line or seven lines at the same time. To win you must have at least three of a kind in a row. The number 1, 2 and 3 lines are straight across. The other four numbers have "V" shaped lines as seen in the picture in right. Bonus slots and progressive slots are similar in that they pay-out a big jackpot. Most bonus slots and progressive slots will only pay out if you are playing for the maximum credits, so make sure that you check the payout table before playing if you have no plans on playing for max credits. While bonus slots have a fixed jackpot, progressive jackpots keep on growing until someone wins it all. Some progressives on the Internet can get as high as $500,000. It is a good idea to look for a jackpot that hasn't been won for a while to increase your potential winnings. Gambling in general is usually a losing proposition, and even more so when it comes to slots. If you are going to play slots at any casino, you should play with a bonus. New players will be able to claim up to $3000 in bonuses at the Bovada Casino!